A balanced growing environment is necessary to produce healthy turf that can withstand abiotic stresses and less than ideal weather conditions. 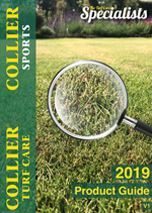 Strengthening turf and maximizing the growing environment before the onset of stress is the only way to ensure consistent, high quality turf when conditions begin to deteriorate. With that in mind, we are pleased to introduce Providian, a complete, balanced plant stress and turfgrass health enhancement package. Providian contains Aquatrols patented “Synergy” technology combined with a proprietary blend of the highest quality cold process sea plants, multi-source chelated iron and manganese, and a custom amino acid package. The sum of this unique stress management package is greater than its individual parts, resulting in a more balanced growing environment and healthy, resilient turf. Application Rate: 20 - 25 ltr/ha.